Up until about a month ago I had carpet in my bedroom and I HATED IT. Between allergies, constant city dust, and senior dogs, having carpet just wasn’t right for our lifestyle. I rent and didn’t think changing the floors would ever be an option, but when it was time to renew our lease and our manager offered to replace or clean our carpet, I seized the opportunity to ask if we could replace the floors at our own expense instead. They surprisingly agreed to my request and gave me the freedom to pick the flooring option of my choice. I knew whatever option I chose wouldn’t match the rest of the apartment anyway, so I decided to give in to my desire for white floors. I did some research and the easiest and most cost effective of our options seemed to be VCT (vinyl composite tile). Plus, I’m always down for a mid-century vibe and you can’t get anymore mid-century than vinyl tiles. I ordered a bunch of samples and ended up choosing Armstrong’s Carnival White , an off-white color with multicolored specks priced at $0.91 per square foot. It’s really cute and has the vintage speckled look I was going for, but was the most cost effective for me as well. Since I rent I didn’t want to invest too much, if you get what I mean. This was my first time installing VCT tiles so I’m no expert, but I can tell you that there are some very good and thorough tutorials on YouTube that can explain the techniques you need better than I can through pictures. If you’re planning on doing this project I highly recommend watching several of them. Luckily my room is pretty much a square so there wasn’t many complicated cuts and I was able to finish the room within a day, by myself, spending less than $300 total. Here’s a terrible picture of what I started with. As you can see the dark beige carpet and old pink paint absorbed most of the light in the room. The first thing I had to do was remove the old carpet. That was a lot easier than expected and I was able to do it all in one piece. After that I pried up the tack strips and used pliers to remove any stray staples in the floor. Then we took the opportunity to paint the walls a nice high reflective white . After the walls were done I got started on the floor. I used a chalk reel to mark the center points of the room where I would begin laying tiles. Next I dry laid some tiles to make sure they would be even and to decide on which way I wanted the speckled pattern to run. A lot of of the time the tile is installed with an alternating pattern but I decided to run mine all in one direction for a seamless look. Then I had to use a small notch tile trowel to apply adhesive to the floor. I want to note that this took longer than expected to dry, and didn’t dry clear like the container said it would. I let it dry for SEVERAL hours until it was tacky and a dark amber color. If you start laying the tiles too soon they’ll slide around and make you regret everything. Also, wearing knee pads will save your life. At this point my dog decided to get around my barricade and lay directly in the glue, promptly getting stuck and full of the stickiest glue that no dog shampoo on earth could remove. After throwing him in a bath to soak and cutting his hair, I was able to continue onto actually laying the tile. I didn’t get pics of that process because I had to move fast, but I started from the middle line and worked my way out. Once I got to the edges I used a utility knife to cut the edge tiles to size. YouTube will explain all that to you in better visual detail. As you can see there were some small gaps between the tile and the wall. You can put a piece of trim around there to finish it off or you can use caulking to fill it in like I did. For the threshold I simply used a piece of flat molding and wedged it in the door frame. Simple and sleek. I let the tile set for about a day and then mopped it and applied four coats of floor polish with a microfiber mop. What a difference! My room feels so much cooler, fresher, and brighter! I only wish I had done this sooner. Here’s how it looks furnished. Much better than before! You guys, let me start by saying I’m bummed because I lost all of the how-to pics from this project when my old computer died, BUT I still wanted to share how easy it is to make your own curtains. I couldn’t find any light blocking curtains that I liked for my bedroom so I took on the task of making my own. Curtains are the easiest thing to make if you can sew a straight line. All you need is enough fabric to make a panel long enough to fit your window and hem all four sides, leaving a big enough loop at the top to fit a curtain rod through. I found a really nice and inexpensive fabric in the perfect shade of buttercup yellow, but the problem was that it was too thin and let a lot of light through. We’re not morning people so this was a no-no. To remedy the problem all I did was lined my fabric with an old black out curtain from IKEA. Easy enough! Doing that completely blocked any light from coming into my bedroom and also added some much needed weight and heft to the panel. For some extra flair I added a strip of vintage looking rope fringe to the top. Tada! Stay tuned for more bedroom decor updates and be sure to follow along on Instagram. Like for a lot of people, my bedroom is my retreat from the world. To me there’s nothing better than crawling into bed after a long day and snuggling up with my pups and husband. On weekends we spend a good amount of our days in bed bingeing on Netflix, taking naps, and basically hiding from the rest of humanity for a while. I take my bedroom sanctuary very seriously, you guys. It’s easily my favorite room to be in. I’m sure this rings true for most of you as well, but believe it or not, I’ve heard a lot of people say they don’t particularly like spending time in their bedrooms. I think it’s probably because bedrooms often get overlooked in terms of decorating. A lot of us spend more time and effort making the more communal areas of our homes comfortable but often ignore what’s behind the closed doors of our sleeping quarters. I’ve teamed up with Downy Unstopables to give you a few little tips and tricks to help turn your bedroom into your ultimate relaxation station. Color and decor change our mood without us even realizing it. When decorating your bedroom, make sure you choose colors and decor that make you happy and relaxed. Have you ever been in a horrible hotel room and couldn’t relax because the decor was so gross? Oh, is that just me? Regardless of whether you go for a fresh garden scheme with florals and pastels or a simplistic modern scheme with muted and soothing colors, just make sure it makes you feel good. Try bringing decor pieces and accessories you love into your bedroom, like framed pictures from your vacations as art, things you like to collect, or your favorite family heirlooms. Make it your own personal happy place. The soul of the bedroom lies with the bed, obviously. I’ve slept on many mattresses in my life and I can tell you the one thing I’ve learned is that a bed is only as comfortable as the bedding on it. You’d be surprised with how new, good-quality bedding can make it feel like you’re sleeping on a brand-new bed. Clean, crisp cotton sheets and a nice fluffy duvet will keep you comfy and cozy in the best way. Don’t forget to make them smell nice! Downy Unstopables In-Wash Scent Boosters keep your sheets smelling fresher for longer. By improving the comfort level of your bed, you’ll improve your quality of sleep. It’s science! I can’t even emphasize the importance that scent has in a bedroom. I mean come on, how is anyone supposed to really relax in a stinky- or stale-smelling room? You can’t easily ignore unpleasant smells, and scent can change your mood drastically. You know that great feeling you get after you’ve just cleaned? You can have that all the time with Downy Unstopables. The line has plenty of scent solutions to keep your rooms smelling their best, from wall plug-ins, to room sprays, to candles for ultimate ambience. Remember that fresh garden decor theme I mentioned earlier? There’s a scent to match that. Want your room to smell like a fresh summer day? There’s one for that too. 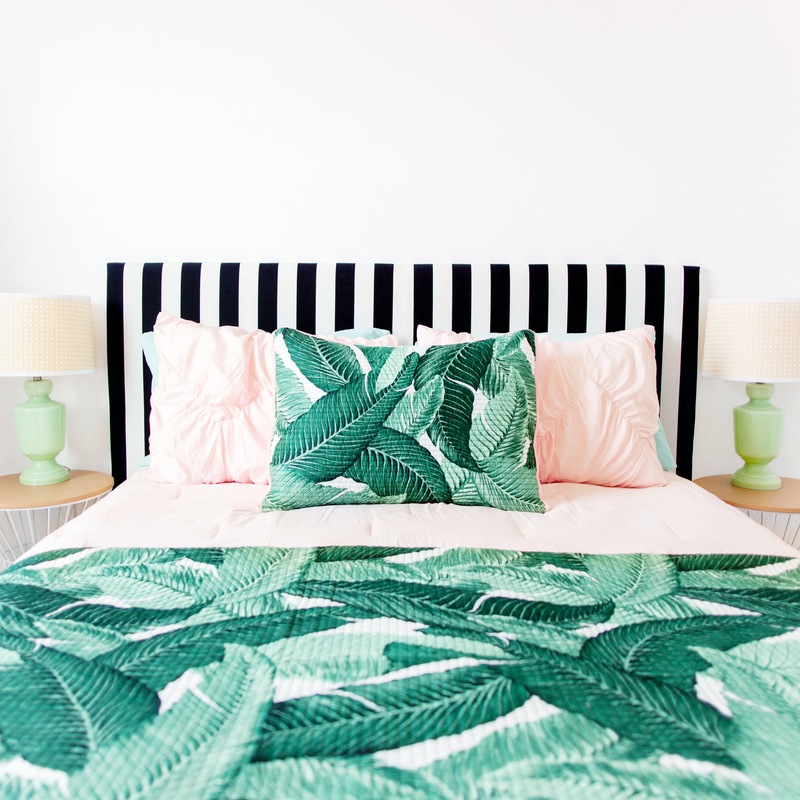 I hope these quick and easy tips help you create the bedroom you deserve and desire. Sweet dreams! Disclosure: This post was sponsored by Unstopables through their partnership with POPSUGAR. While I was compensated by POPSUGAR to write a post about Unstopables, all opinions are my own.